Do you feel that you belong in the ocean? Become a freediver! Patagon Dive Center is proud to announce our new PADI program starting in December 2016. How to be a safe freediver. Training and Open Water Training. The PADI Basic Freediver Course is the classroom and confined water portion of the full PADI Freediver course. Students complete book work on their own then go over the material in the shop on the day of their class with a certified instructor. After the classroom portion students will participate in a confined water sessions in water no deeper than 20 feet, to learn the basic or "intro" to freediving. This is a 1- Day course, 8am - 2pm, with a 1 hour lunch break. 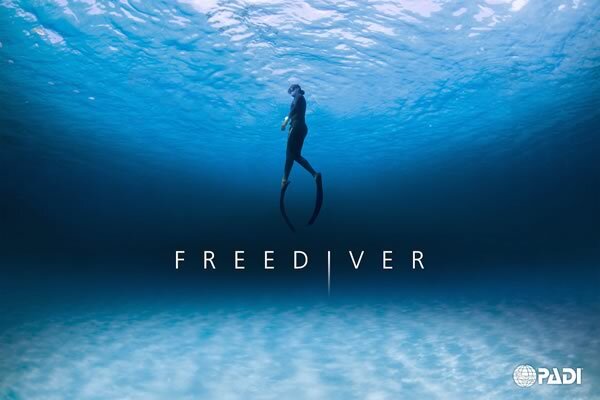 The PADI Freediver course or "Level 1" course combines the PADI Basic Freediver course described above plus 2 x 2 hour open water sessions on the second day. This is a 2-Day course that focuses on combining the knowledge, confined water, breathing exercises, and freediving technique to achieve greater depths and longer bottom time. Max depth for the PADI Freediver course is 55 feet. The freediver course will allow to dive and be certified to a depth of 55 feet deep. Other advanced courses will be available to the next levels beyond depths of 55 feet. Oour freediving courses will be conducted in both St. Thomas and St. John. Please contact us by email if interested and/or want more information.